With the wealth of knowledge from experienced keepers here in SKF, we should have a repository of Shrimp Diseases where people can come to diagnose and hopefully find a cure to their shrimp's ailment. 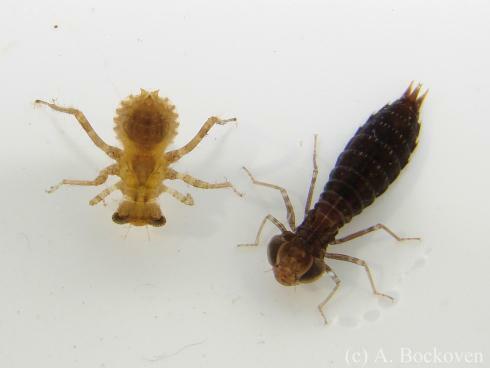 Just like in the world of aquatic fish keeping where identification and diagnosis of diseases in fish and known cures are part and parcel of every aquatic forum, so should we have one for shrimp. I'd like to start this database off with the not so uncommon Vorticella parasite which looks like White fungus or mould growth on the shell of the shrimp. Vorticella is actually a protozoa of 16 known species, not a fungus at all. Vorticella are aquatic organisms, most commonly found in freshwater habitats. 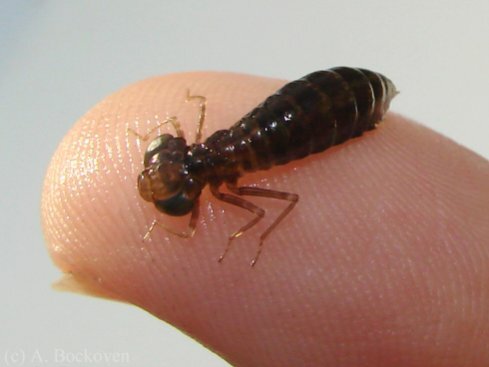 They attach themselves to plant detritus, rocks, algae, or animals (particularly crustaceans). Vorticella are heterotrophic organsims. They prey on bacteria. Vorticella use their cilia to create a current of water (vortex) to direct food towards its mouth. Typically, Vorticella reproduce via binary fission. The new organism splits from the parent and swims until it can find something on which to anchor itself. If left untreated, vorticella have been known to cause the death of the shrimp it was attached to. Here are examples of what it looks like. Known cures: Salt bath with aquarium salts. Be careful not to use table salt with Iodine. Dosage: 1 teaspoon to 1 cup of clean tank water (not tap water). Duration: 30sec to 1 minute. You might need to repeat this a couple of times until the vorticella disappears, so keep the infected shrimp in a breeder or hospital tank (could be another cup of tank water). Possible causes: Poor water conditions. Increase water change frequency. Low doses of the salt bath have been know to be ineffective. Ick and fungus cure meds don't work on Vorticella. Seachem Paraguard could work as well at the full recommended dosage, since this is a parasitic med. But Seachem have admitted Paraguard isn't invertebrate safe. So only try paraguard as a last resort and drip it into the tank premixed from a bucket of tank water slowly . This treatment is in no way a replacement for good tank husbandry. So keep up with your water change routines, and removal debris and uneaten food. Please add if you know of more diseases, how you cured it, what you tried that worked and what didn't work. 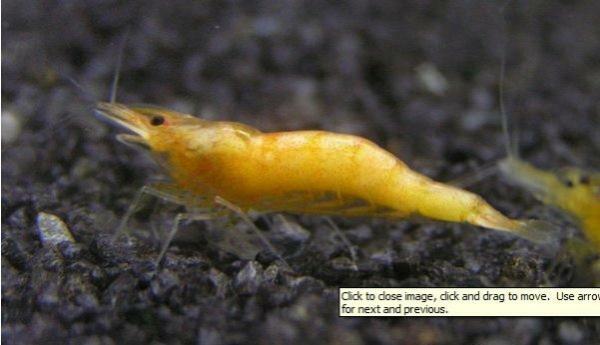 This is one of those diseases that is still very difficult to diagnose in shrimp. There isn't much information around. Nor are there lots of pictures. Bacteria never stop and smile for the camera. 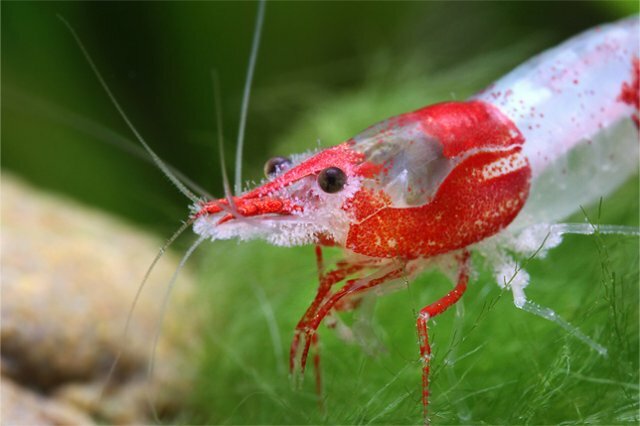 In various "transparent" shrimp species in which the organs are visible from the outside, you can observe an internal infection, the inner translucent bodies which appear dark in healthy shrimp are pink and look as if they were inflamed in infected shrimp. Various studies of diseased shrimp showed that their bodies were infested with micrococci (bacteria). Infected animals with recognizable symptoms die 2-4 days later. Treatment is not yet possible. Shrimp on left is infected with Micrococci. I have uploaded it to SKF in case we ever loose the document linked above. 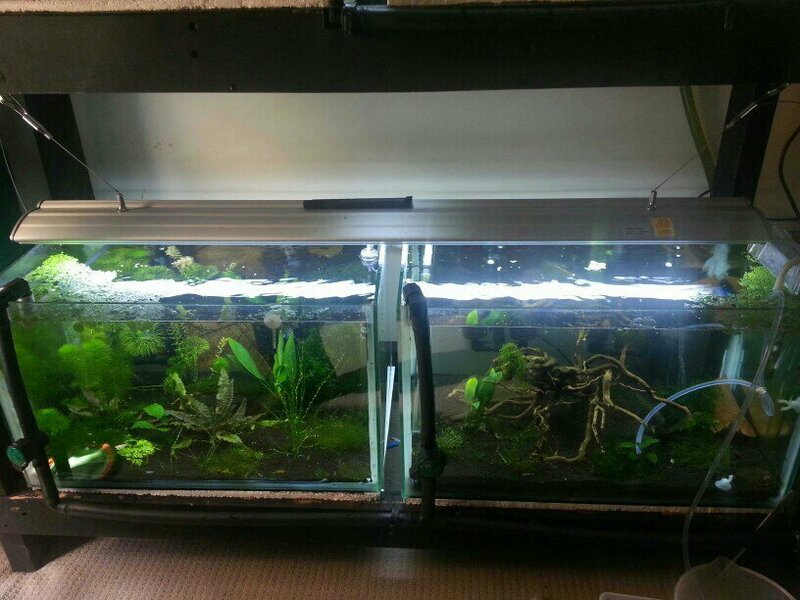 Treatment 1: large water changes (80%) daily. Duration: once per day for 5 days. The infection could be parasitic in nature. And the bacterial infection is just secondary. So be very careful to examine the shrimp for signs of external parasites first. Be aware that when you notice visual signs of the symptoms as indicated above, it's usually very advanced in it's infection. 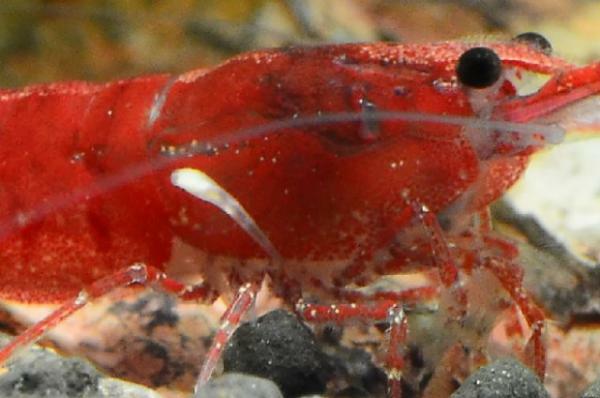 Expect more deaths of some shrimp that are too far gone. You might save the rest however. You'll probably have already lost quite a few shrimp. It's either do nothing or break the tank down, sterilise it and start again. Or Go for broke and try a treatment. Hydrogen Peroxide will have the added benefit of killing off any algae in the tank. The increase heat in summer weather can also increase the likely hood of bad bacterial growth. So keep up with your water change routines, and remove debris and uneaten food. 14 April 2015 - Update based on experiences of one of our SKF members. Unfortunately for this shrimpkeeper it was too late to save these shrimps, but hopefully this experience will help someone else. 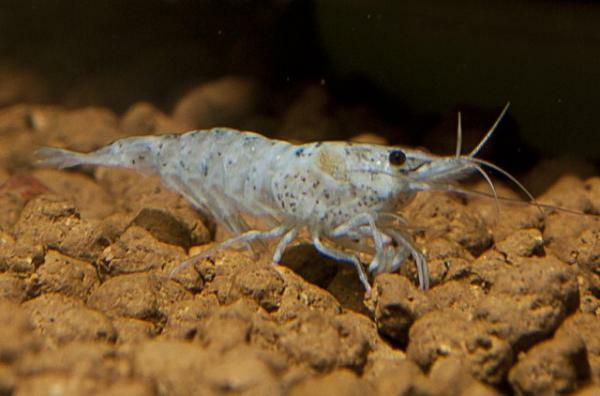 250+ shrimp were lost before the bacterial infection was halted. A vet was consulted and he eventually ended up contacting a senior lecturer of aquatic animal health at University of Adelaide school of veterinary science. He stated that bacterial infections being internal or external are almost always gram negative in aquatics and recommended using oxytetracycline at a dose rate of 1000-2000mg per 40ltr of water. "Symptoms were some looked normal, most lost colour and went very pale. All shrimp went very sluggish with a lot dying upright where they stood. They actually looked alive until you touch them and they fall over. Deaths were minimal and spread out to start with, then became rapid and multiple deaths quickly. 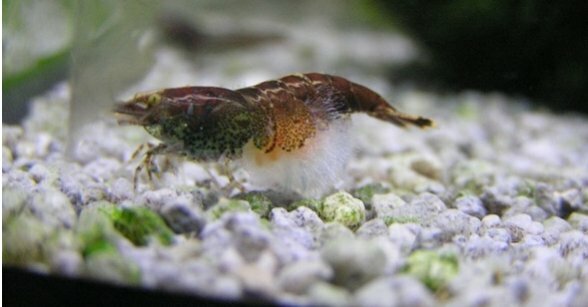 I still lost a few shrimp after treating for 2-3 days but I would imagine that to be normal, as it was already too late for them." 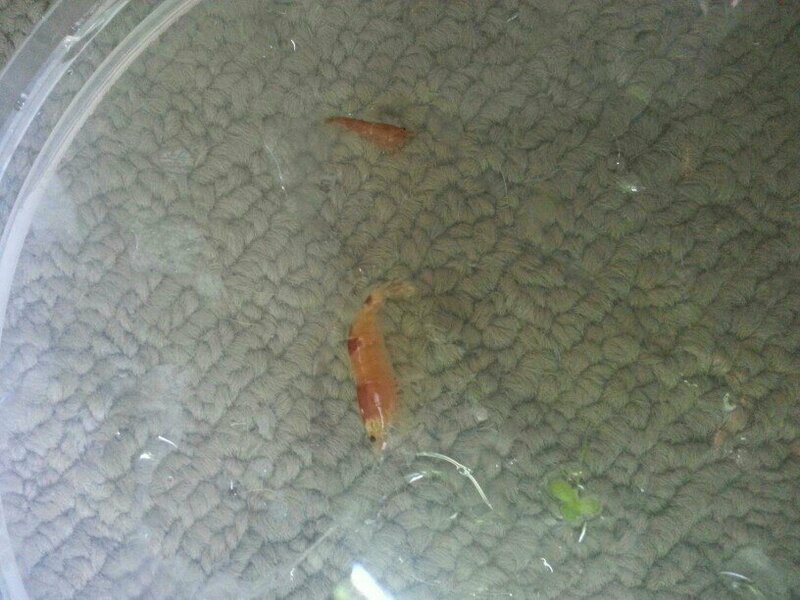 The shrimp looked normal but sluggish, doesn't seem to be any changing of colour that shows until they die. 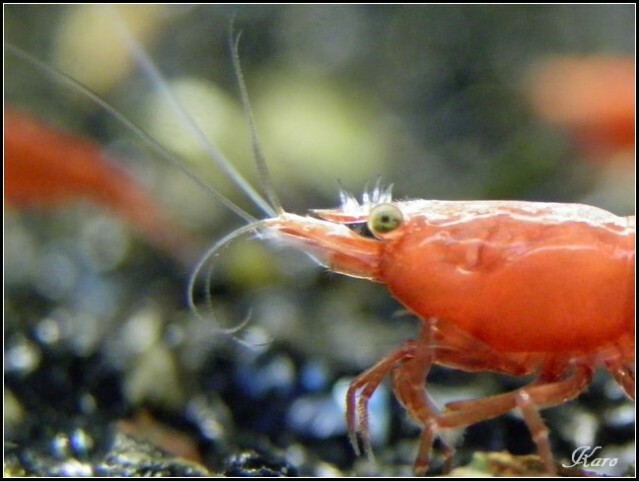 However, you might be able to spot infection of the internal organs (located in the head of shrimps) prior to death where the organs turn an orangey colour. Some pictures included. Notice the orange colour on the head, which clearly show signs of infection of the internal organs. Oxytetracycline is available in 2 forms. Powder and injectable. The injectable form was used as it is a stronger form. This meant that we could use less to obtain the required dosage. Dosed straight into the water column at 1000mg per 40ltr of water. Follow the dosage instructions for the FULL duration of the treatment, even if your shrimps are looking better. Do NOT stop treatment short, as this will develop strains of bacteria with resistance to future treatment. Drug worked very well and reasonable quickly. Deaths stopped within 2 days and no more deaths since. The drug will stay active in the water for 2 days. Dose the required amount on first day. Then 50% water change on 2nd day and dose again. Then 30-40% water changes for the next 2 days and then did another full dose and left it. Waited 2 days and another 30% water change. This medication will turn your water yellow, but disperses after about a week. 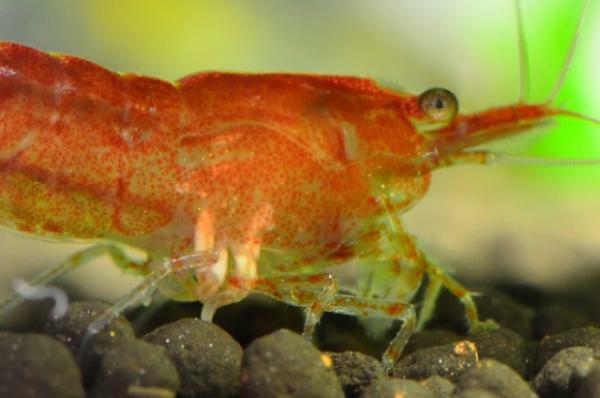 Quarantine any new shrimp before introducing them into your existing colony. 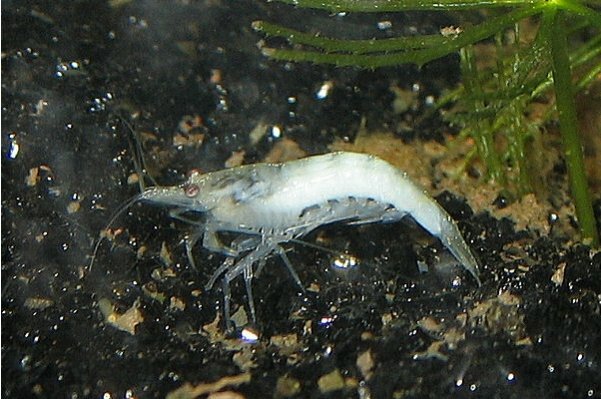 The shrimps were kept in this member's tanks were filtered via a sump system. The infection of one tank might have spread to all the other tanks due to the shared filtration and water. Oxytetracycline and any Tetracycline based product is an antibiotic. As with any antibiotic product, there is a strong chance that it will impact your filter media bacteria in a negative way. Please take all precautions to save the bacteria in your filter media. Turn off the pumps to your filter temporarily. Remove some or all your filter media and place in another location with aeration. Another option is to remove the livestock that needs treatment into a separate hospital tank for the duration of the treatment. 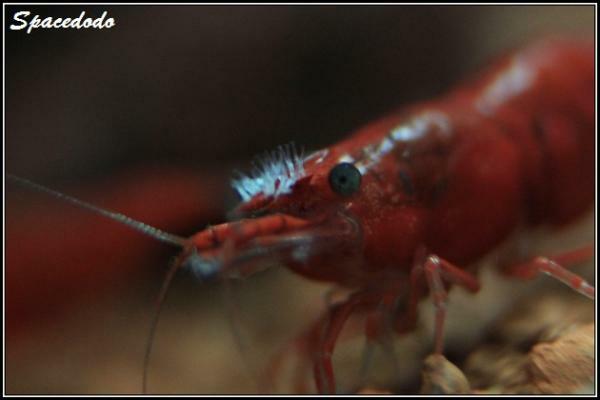 Shrimps are small, so even a 2 Litre plastic container with tank water might be enough to hold them temporarily. Apart from the Tetracycline antibiotics already mentioned above, the following are additional antibacterial treatments. Please note that these are usually prescription drugs and will need a vet or doctor’s script to obtain. As with all antibacterial medications, please be extra careful to avoid using this in the tank, as it might kill off your beneficial bacteria. 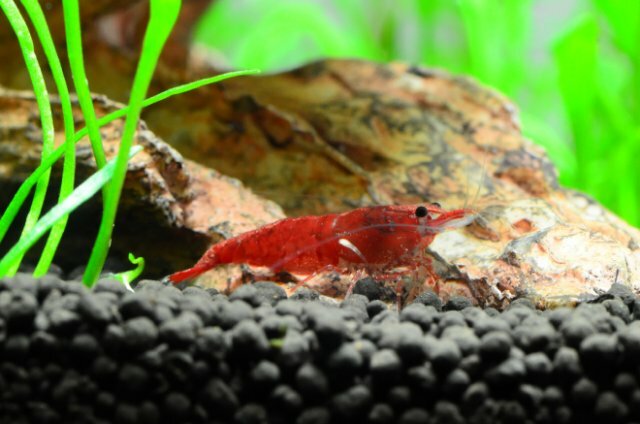 Instead remove the infected shrimp to a temporary hospital tank or bucket for the duration of the treatment. Out of all the antibiotics available, Tetracycline and maybe quinolone product called Baytril below would be the most accessible. Note: always follow the full course of the treatment or you risk the problem of antibiotic resistance. ‘Baytril’ is the brand name of an antibiotic called enrofloxacin. It is available in tablet form, as an injection and also an oral syrup. The oral syrup can be dissolved in the water. Enrofloxacin is also sold under other brand names in Australia, notably ‘Enrotril’. All brands of enrofloxacin oral syrup in Australia are the same strength. ‘Enrotril’ and ‘Baytril’ oral syrups both contain enrofloxacin at a strength of 25mg/ml and therefore from a therapeutic point of view are identical. Enrofloxacin belongs to a group of antibiotics called fluoroquinolones. Another antibiotic in the same group, used more overseas, is ciprofloxacin which is often abbreviated to ‘cipro’ by pigeon fanciers. 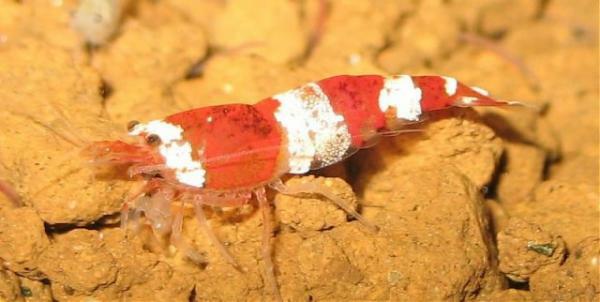 Baytril can be used for muscular necrosis and milky white discolouration of shrimp. Dosage: use 1ml per 50L of water per day for a full 5 day treatment. Even if the shrimp looks better after 2 days, continue the full 5 day treatment to avoid resistance of the bacteria to the antibiotic. Where to obtain: Baytril is a prescription medication that only be obtained from talking to your veterinarian. It’s broad spectrum antibiotic that is used for birds. But a search on Google might get you some results for direct purchase sources. Chloramphenicol belongs to a group of medicines called antibiotics. I’m not sure if this requires a prescription (ask your chemist). Can be used for internal and external bacteria. Dosage: 1.5gm per 100L of water. Change 80% of water after 1 week and repeat dosage again for another week. Then return the shrimp to the main tank and observe. If you can also soak the food in Chloramphenicol, and fed to the shrimp, then the drug can also be absorbed internally. Ampicillin is an antibiotic in the penicillin group of drugs. It fights bacteria in your body. Ampicillin is used to treat many different types of infections caused by bacteria. Ampicillin is effective against Gram-Negative bacilli, however its poor solubility means it has to be fed to the shrimp. Dosage: 2-3gm per 100gm of food. Where to obtain: Not easily found in Australia, but this might be available for some of our overseas members. It’s a prescription drug, so be aware that you cannot just buy it over the counter. Gentamicin is a bactericidal agent that works by inhibiting protein synthesis in susceptible Gram negative bacteria, Citrobacter, Endobacter, aerobic, pseudomonas or rod shaped bacilli. Dosage: 1ml/day per 100L of water for duration of 5 days. Perform a 25% water change each day. These might not necessarily be detrimental to the shrimp. Many live in a symbiotic relationship with the shrimp as can be seen in wild shrimp. But if it was me, I say burn them parasites! Treatment is the same as Vorticella. Duration: 30sec to 1 minute. 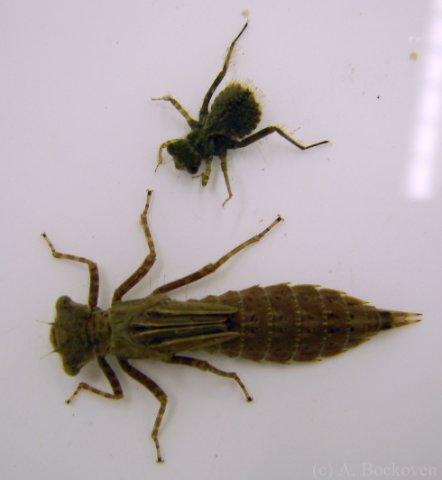 You might need to repeat this a couple of times until the parasite drops off, so keep the infected shrimp in a breeder or hospital tank (could be another cup of tank water) to allow easier re-treatment. Another treatment that has been known to work is Genchem's "No Planaria". Use half the Dosage as per instructions on the packaging of No Planaria. Duration: 3 days, although you might see the pests disappear after one day, continuing treatment will ensure any unseen parasites are also killed. Perform a water change at the end of No Planaria treatment. Watch for ammonia spike and treat if necessary. Similarly, Benibachi Planaria Zero well also work in killing these parasites. Another product that might be useful in treating these pests is a product called "Internal Parasite Clear" by Guangzhou Bigfish Aquarium Corp.
Update: Internal Parasite Clear (half dose including 1/2 dose follow up treatment 3 days later) and Planaria Zero by Benibachi have been confirmed as effective treatment by SKFA members. This thread on diseases and diagnosis is meant for the SKF community to contribute to and to add their experiences. Can some one who has treated their tank for Planaria or Hydra share their cure method, what worked what didn't, dosage, duration and pictures? I've successfully removed hydra from my tank about 2 months ago following Dean's recommended dosage using Internal Parasite Clear. Thanks Sprae, and of course thanks to Dean for the original thread on dealing with Hydra and Planaria. While these are not specifically a disease, having one or more of these nasties in your tanks is sure death for shrimp (even small fish). Check out the pics below and you'll under stand why. Use these to help you identify them too. The only treatment is removal manually. Locate the nymph and use a net to manually remove them. Shrimp with this condition is diagnosed with a white or milky discolouration of it's back part, more specifically, the muscle tissue within it's shell. this symptom is called Muscular Necrosis. Necrosis in biological terms is understood to be the destruction of one or more cells in a living organism. The result is an inflammatory reaction or decomposition of the surrounding tissue. Proteins produced by the decomposition of the cells will be released. And the milky white colour is seen in the tail part. Stresses in big pH changes, lack of nutrients and oxygen deprivation, can also lead to cell death under certain circumstances. This milky white discolouration usually begins in the tail region and spreads in a few days towards the head until the whole rump is a milky white appearance. 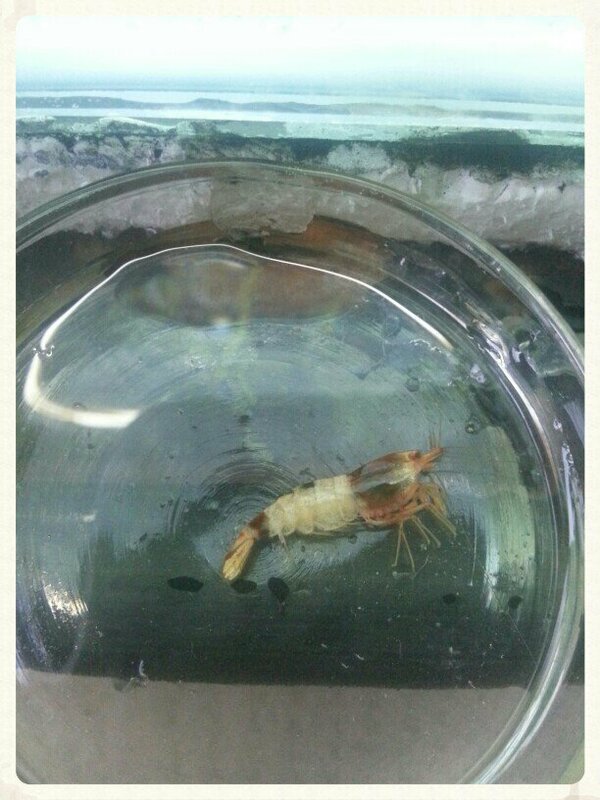 Treatment: Isolate the infected shrimp immediately, as muscular necrosis can be infectious. Generous daily water changes can often abate the disease. However, if the condition has affected the entire abdomen, a cure is no longer possible and the shrimp will die within a few days. Check water parameters in the main tank. Ensure all parameters are within tolerated ranges for the species. This includes temperature, pH, KH, GH, TDS, Ammonia, Nitrite, Nitrates, and oxygen levels. 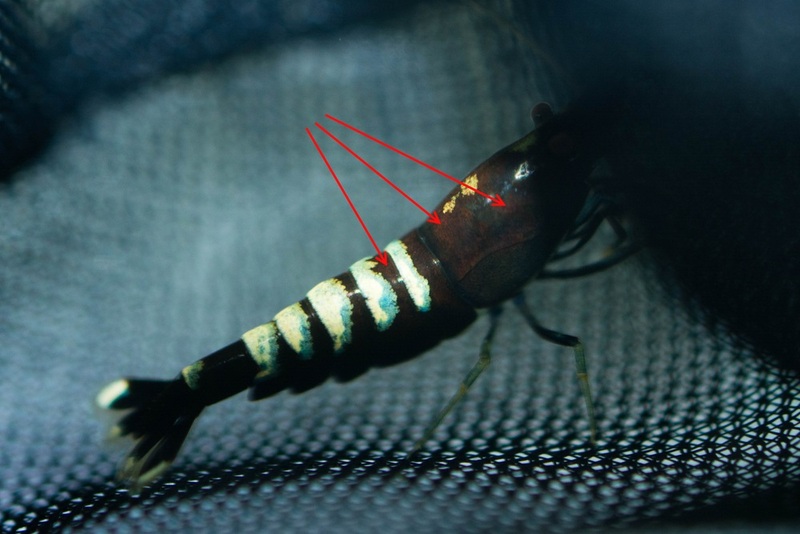 Fungal infections are common in the fish hobby, but it possible for shrimp to get fungal infections as well. It's unavoidable, since fungal spores are everywhere, in the air and water. Fungi are plant like organisms but unlike plants are not capable of photosynthesis. All fungal diseases are called Mycosis (plural: mycoses). Internal infestation by fungal spores is usually ingested by food. If the immune system is intact, the shrimp can fight it off. However, if the internal organs are infected by fungal spores, death is possible. Internal diagnosis is difficult and only possible under a microscope. An external/superficial mycosis infection however is visible to the naked eye. Symptoms of superficial fungal infection caused by Achlya or Saprolegnia can be seen as white fluffy cotton growths in the abdomen or head areas. 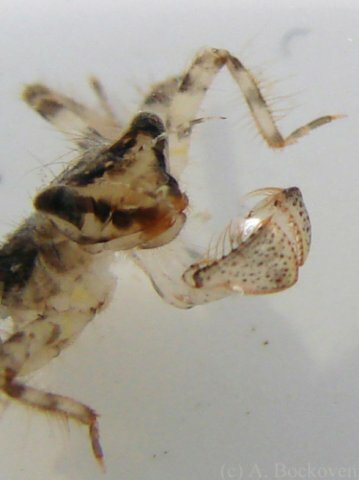 As mentioned fungi are usually fought off by a healthy immune system, so we only see this in weakened or injured shrimp or just after a moult. 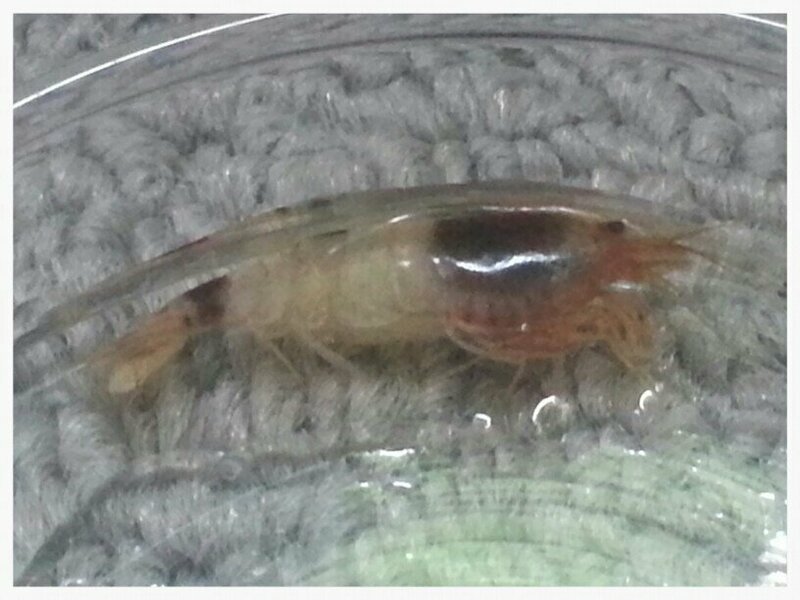 The moulting process takes a lot of energy out of the shrimp and it's immune system will be heavily loaded. It's during these moments when the shrimp have been weakened that fungi can take hold. Spores attach themselves to weakened sites on the shrimp and break out as a cottony white growth. If not treated quickly, the spores will invade any dead tissue cells and in the process infect more tissue causing a greater infection. 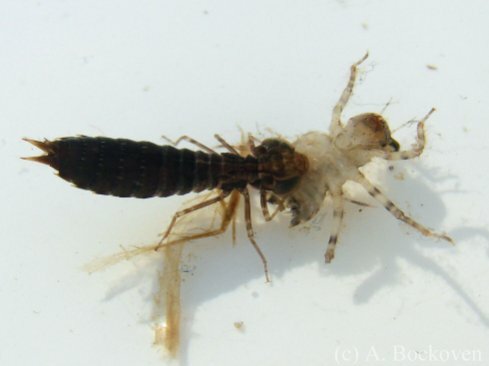 At times, if the infection is only on the surface of the shrimp's shell, a moult can get rid of the fungus. It is only by timeliness/chance that such a situation could rectify itself. At other times, treatment is required. Dosage: follow packaging instructions for the dosage and duration. Note: JBL Fungol does not contain copper but it also says not to use it with invertebrates. 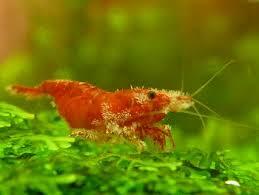 If left untreated the shrimp will die, so a certain risk in using the product is going to be required. Fungol could be replaced with a similar fungal medication, but check that the product does not contain copper at least. As an application for external parasites and prevention of eggs getting fungus. Dosage: 3-4mg per 1L of water. For treatment of fungal infections. Dosage: 0.05mg per 1L of water for a duration of 7 days. 50% water change each day. I have to send a massive thanks your way for going to all the effort to do up these articles. 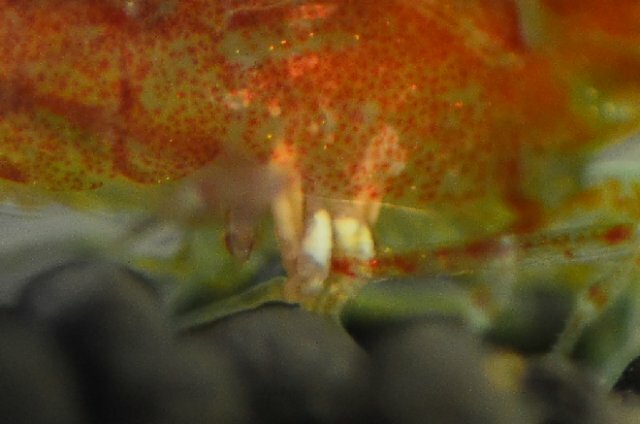 I have just noticed what I think is Scutariella in one of my tanks and I wouldn't have been able to notice/identify it this early if not for your posts. I'm doing a water change at the moment and will be trying to source some no planaria tomorrow for treatment, so fingers crossed I have it early and can limit any adverse effects. If you suspect scutariella, a quick salt bath is far more convenient, and less expensive. You'd want to try that first. You are right, though I'd have to pull the tank apart to catch the different shrimp (more than 1 affected, interestingly not the crystals though) and I would worry about parasites in the tank etc. I also noticed some tiny hydra, so overall no planaria was an easier option. i did a half dose yesterday and 24hrs later it looks like the parasites have jumped ship from shrimp heads, no apparent negative consequences with shrimplets and even the rams horn snails are still alive (I have been dosing prime in case of an ammonia spike). 2nd dose today as the hydra haven't totally disappeared yet, fingers crossed everyone survives! While the Bacterial Infection post above is an example of internal infections, this one is more an external infection (unless erosion of the shell is severe). This is essentially a bacterial infection of Chitinolytic bacteria (Gram negative rods) including Vibrio spp. , Benekea spp., Pseudomonas spp., Aeromonas spp., Spirillum, spp. and Flavobacterium spp. 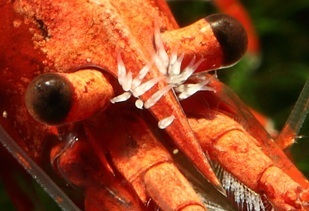 The impact on the shrimp is visible as the exoskeleton becomes pitted, eroded, and melanized at the site of infection. Diagnosis: Erosion of chitin demarked by dark brown to black pigmentation demonstrates chitinolysis. Marks change colour from a rusty to a brown and finally a black colour. Ulcers form on these lesions, as the bacteria will destroyed muscle tissues under the shell. This opens the shrimp up to other secondary infections. The most common sites of infection is the gill, abdominal muscle belly, tail section and gastropods. Seriously infected will just lie on its side, only gastropods and gills in motion. 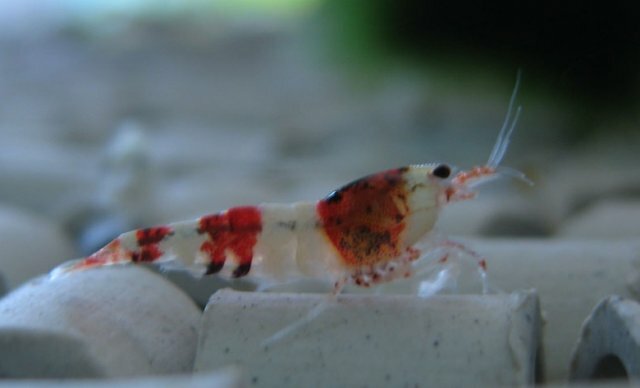 Pictures of infected CRS seem to exhibit infection on the red areas and not on the white areas of the shrimp. There are many possible causes. Tank hygiene and maintaining water quality are crucial. Levamisole HCL from a product called Big L's pig and poultry wormer, as Jenbenwren has found it cleared shrimp of this disease. Dose is 1ml per 7 litres of aquarium water. Re-dose after 48 hours if needed. 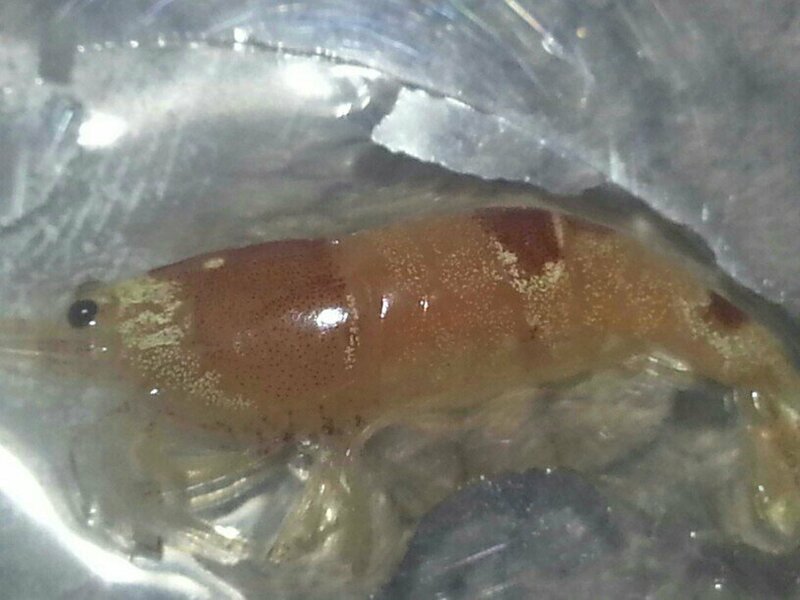 Forum member Urak, has also had success curing a Yellow Neocaridina using a combo of Oregano and Hydrogen peroxide. This is a picture of Urak's Yellow cherry before treatment. The disease shows up very clearly on a yellow cherry. 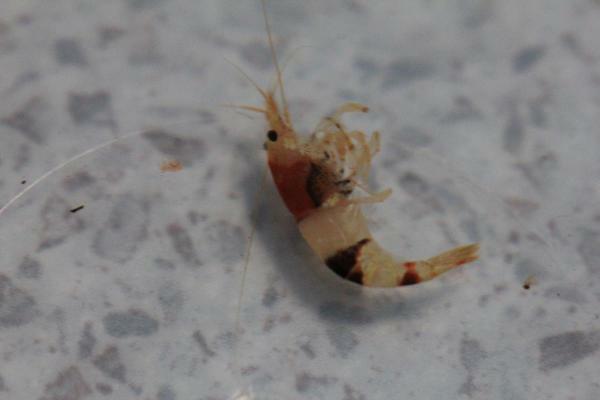 The shrimp was given a treatment of Hydrogen Peroxide to start with on day 1 and 2. The treatment was switched to using oregano oil after day 2. Oregano Oil (Carvacrol 83%) diluted in distilled water at roughly one drop of Oregano oil to 90 drops of water (90 drops = roughly 4.5ml). Higher concentration of Carvacrol oil will need less drops or more dilution. Both are mentioned here, as we cannot conclude whether it was the H202 or the Carvacrol that did the job. Or maybe both. Urak started treatment with Hydrogen Peroxide for 2 days. Dosage: 1ml / 4L (upto 2ml / 4L if you think the situation is drastic). 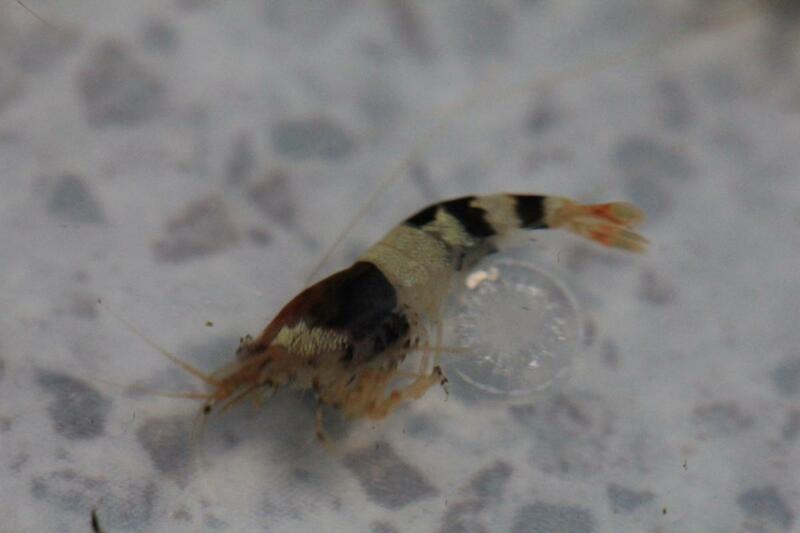 A drop of this diluted oregano oil was added to an algae wafer and fed to the shrimp. A few oregano flakes 5-8 , were also added to the tank. This was repeated for the next 3 days. Suggest performing this treatment with Oregano Oil in a quarantine tank, as oregano oil is antiseptic and could impact the beneficial bacteria in your tank/filter. A quarantine tank will also ensure that you are feeding the treated algae wafer to only the sick shrimp, and not healthy shrimp. Strict quarantine - every tank showing any signs, at all. And those tanks that have been exposed to contamination - nets, plants, hands... anything that has shared the same water must be assumed to be contaminated. Quarantine also means, do NOT buy or sell any shrimp. 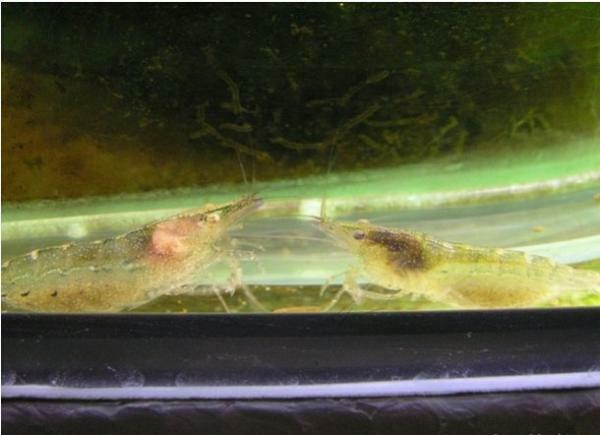 Isolate the infected shrimps to separate hospital tank. Disinfect all tools - nets, tweezers, etc. Boiling them is enough. Water change - Water change is essential, at most 1/3 of the water as the shrimps are very sensitive to water changes! However, more might be necessary if the situation is bad. Remove all items in the tank - disinfect them if suitable. Boil it if practical, otherwise letting them dry out in the sun is usually sufficient. 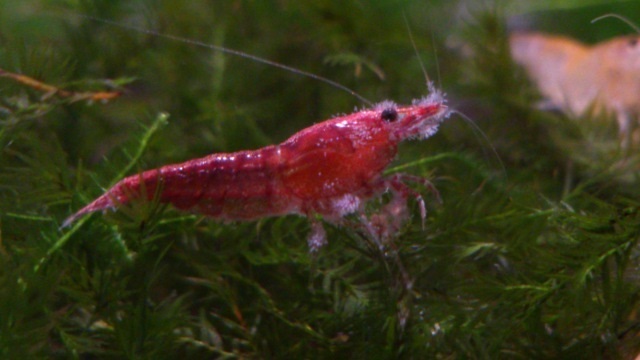 Removing items out of the tank will also help you spot any other dead or infected shrimp that will need to be separated/removed. Increase oxygen and flow rate. 1) Raise pH slightly & slowly by 1 point - the bacteria might prefer acidic conditions. (assumes your pH is low for CRS. 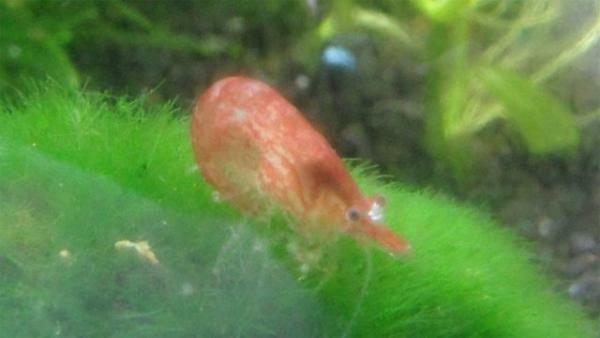 Try the opposite for Cherry shrimp). 2) Add Aquarium Salt to the separated shrimp - High salinity kills most freshwater bacteria by osmosis - they dehydrate. Note: this is a 1-2 minute salt bath only, do not keep the shrimp in salty water too long. 3) Slowly lower temps - bacteria love higher temps, and your shrimp love lower temps. Bacteria usually have an optimum temperature level where they thrive. 4) Since Cyanobacteria is a ... bacteria ... treatment could be similar. So do what you have to for the shrimp as if you are treating for Cyanobacteria. 5) Add aquatic plants to consume excess nutrients and nitrates. 6) Of course maintaining the quality of water within the optimum range is key to prevention, removing the dead and infected shrimps, reducing the stocking intensity, providing good nutritious feed. 7) Check the "Bacterial Infection" post above for treatment tips as well. 8) Finally, drastic measures - incorporating terramycine at the rate of 0.45 mg per kg of feed for two weeks. And bath treatment using 0.05 to 1.0 mg of malachite green per litre of water are some of the remedial measures suggested to counteract the incidence of bacterial diseases in prawns. Oxytetracycline has also shown to be very effective against gram negative bacteria. If caught early enough before the bacteria has eroded through the shell, it is possible to reverse this condition. There have been several cases of the black spots disappearing by itself with a change in water quality. Update on my outbreak: treated with 3 half doses of No Planaria, 24 hours apart and followed by a water change 24 hrs later. 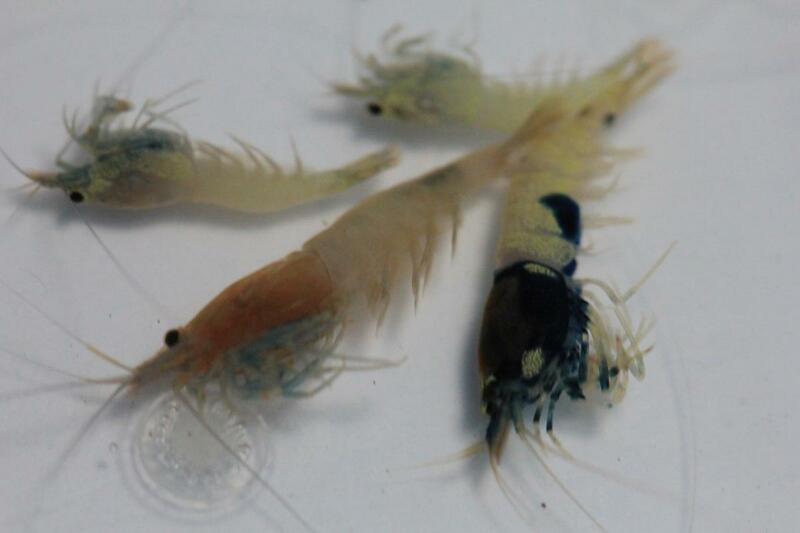 No negative effects were observed on shrimp or shrimplets, only minor snail death(rams horns) but apparently complete eradication of Scutariella within the first day, and hydra over the 3 days. Sorry to see more deaths Blackcat. These CRS are they from the same tank or different tank to the CBS? The flesh of these shrimp have a pinky/orangey colour to them. A symptom of internal bacterial infection. Any idea how long they might have been dead before discovering them? 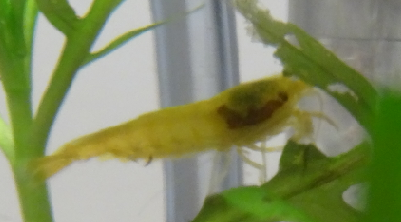 Any signs of more shrimp with this pinky/orangey colouration internally?